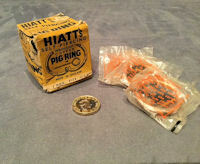 Original, quality pre-war unused copper pig rings in the scruffy but original card box. The box is detailed "Hiatt's self-piercing wrought copper pig ring" and "definitely stops rooting and lasts a lifetime", and contains four unused copper rings. Complete and in good order. Box 2" cube. Original, quality pre-war unused copper bull nose ring in the original card packet. The box is detailed "Hiatts Self Piercing wrought copper Bull ring 2.3/4" and in pencil 7/=. 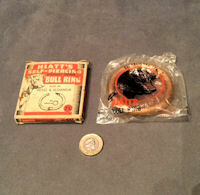 The box is a little scruffy but the ring is still sealed in a plastic bag and the copper is stamped "Hiatts". Complete and in good order. Box 2.75" x 2.75" x 0.25". Original, quality, pre-war, copper bull nose rings of various sizes, each with a grub screw and hinged to enable the ring to be opened. Most are marked 'Hiatt Wrought' and 'British Made'. 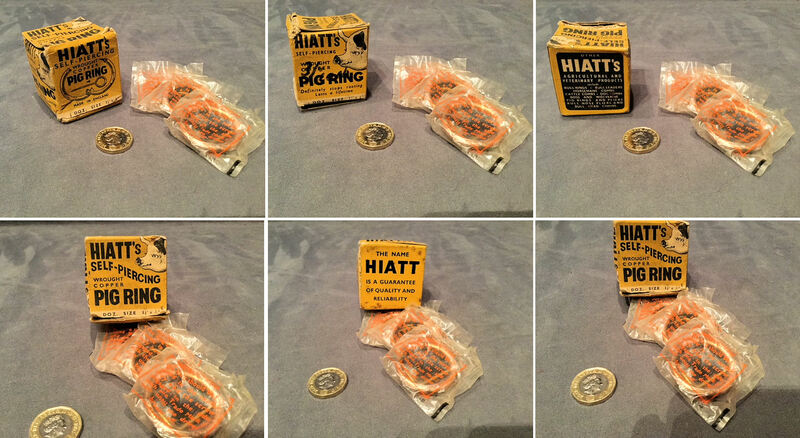 Hiatt was the largest manufacturer of police and security equipment in the U.K., making handcuffs, truncheons and even bull rings. Polished and complete and in good order. 2.75" and 3" external diameter. Price is for each. 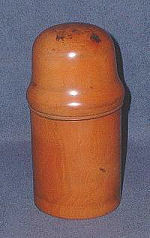 Original, quality, mid to late 19th century, 'Bloodstick' or fleam mallet, turned in boxwood. 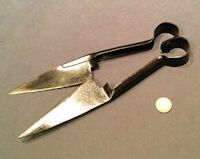 As used by stock owners or vets when using a fleam to bleed an animal to release the pressure or similar. Complete and in good order. 9.5" x 1.5". 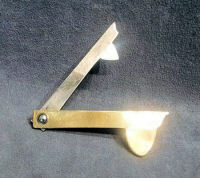 Original, quality, late 19th century, brass cased fleam, with three graduated steel blades and a buffalo horn infill. 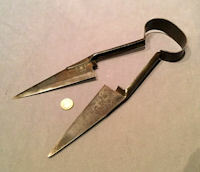 One blade is impressed for the maker "W.Gortts" or similar. 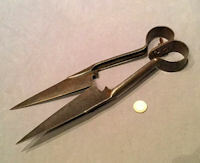 Fleams were used by vets and stock owners to bleed animals to release pressure. This example has been cleaned and the brass polished and is complete and in good order. Closed 3.5" x 1.5" x 0.5. Original, quality, 1920's, fleam with a single blade and steel side covers. The shaft of the blade is marked '1'. Unusual to find these with steel covers, they are usually in brass or horn. All is in superb order and complete. 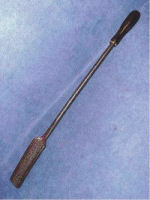 Fleams were used by stock owners and vets to bleed animals to release pressure. Case 4.5" x 1.25" x 0.25". Original, quality, late 19th century, fleam with three varying sized blades, cow-horn side covers and a brass spine. All is complete and in good and working order. 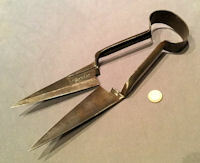 The smallest steel blade is marked for the maker "Thomas Turner of Sheffield. Fleams were used by stock owners and vets to bleed animals to release presure. Case 3.25" x 1" x 0.5". 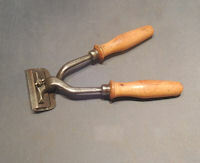 Original, quality fleam, circa 1900, used by vets and livestock owners for bleeding livestock. Unusual with a single blade within a brass case. No maker's mark. Complete and in good order. 3.5" long. 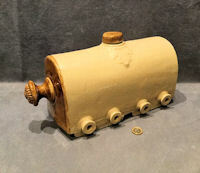 Original, quality late 19th century two tone glazed stoneware "Foster Mother", for feeding orphaned piglets. This super example had provision for nine teats to be fitted and when filled with milk this would feed up to nine orphans. This model was fashioned on the foot warmer shape with a knob to the front and a screw off filler cap to the top. 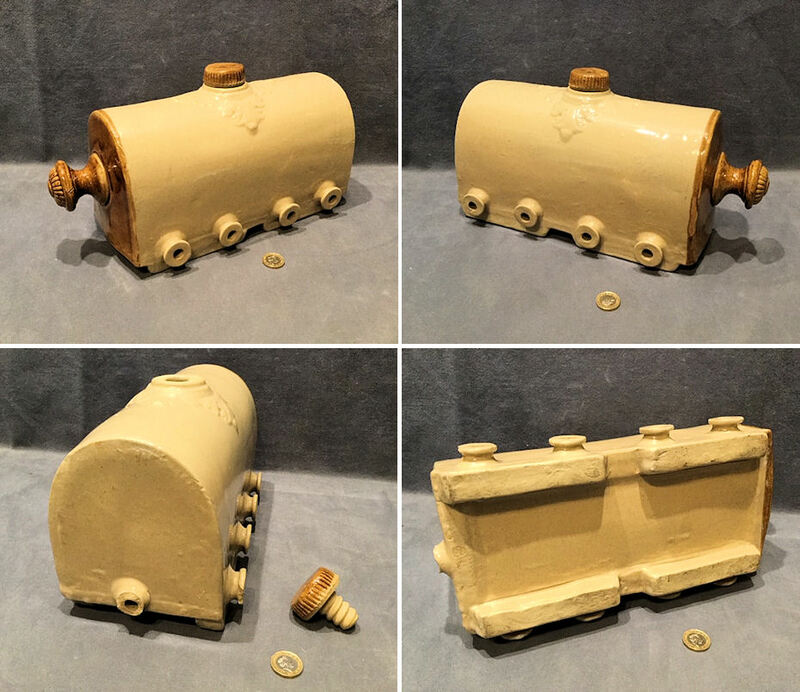 The rear teat holder has broken off and one other is chipped, otherwise all is complete and in good and working order.14.5" x 6.5" x 7.5". 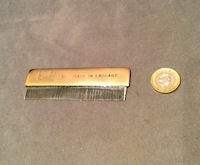 Original, quality 1920's steel dogs' comb mounted with a sheet brass grip detailed "6", "Made in England" and with "Spratts" letters in the form of a Scottish Terrier. The first we have seen. Polished and lacquered, although the lacquer may be removed at no extra cost and complete and in good and working order. 4" x 1.25". 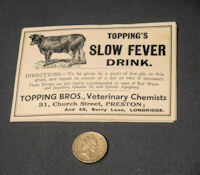 Ten original unused pre-war printed labels detailing, "Topping's Slow Fever Drink for Cattle", Directions for use and "Topping Bros Veterinary Chemist 31 Church St Preston " and 46 Berry Lane Longridge. In super condition and complete and in good order. 4.5" x 3". Price is per pack of 10. Original, quality, late 19th century, blacksmith made horse tooth rasp, with a brass ferule and the original turned beech handle. Complete and in good order. 21.5" x 1.5" widest. Original, quality, mid to late 19th century, blacksmith made wrought iron horse mouth gag, with a brass wing nut on a threaded rod adjustment. The wooden side covers appear to be in rosewood and does have a few grain splits, otherwise all is complete and in good order. The ironwork has been cleaned and lacquered. 12.5" x 7" x 1.5. 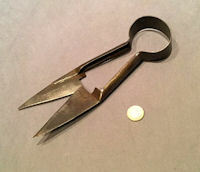 Original, quality, late 19th century, blacksmith made wrought iron searing iron for removing cow horn tips. This example has a turned and shaped ash handle and is complete and in good order. 17.25" x 1.5". Original, quality, 19th century, large fleam mallet in turned boxwood with a steel blade concealed within the handle. The last section of the mallet handle will unscrew to reveal the knife and the head of the mallet will also unscrew. The two sides of the mallet head are marked and scuffed from general use, there is a short grain split to the handle of the knife, but otherwise all is complete and in good order. Ideal also as an auctioneer's gavel. This is the largest fleam mallet we have seen. 14" long, head 4.5" x 2.5" in total. Original, quality, 19th century, turned boxwood fleam mallet used by stock owners and vets when using a fleam to bleed an animal to release pressure. A super example but with some grain splits, otherwise good and complete. 13" x 2". Original, quality, 19th century, turned rosewood fleam mallet as used by stock owners or vets when using a fleam to bleed an animal to release the pressure or similar. One grain split but otherwie complete and in good order. 9.5" x 1.5". Original, quality, late 19th century, pewter clyster pump with a nickel plated brass nozzle. Used by stock owners to administer enemas to livestock. Complete and in good order. 18" x 3" with nozzle. Original, quality, 19th century, blacksmith made horse tooth rasp with a brass ferrule and an ebony grip. Complete and in good order. 24" x 1.75" widest.